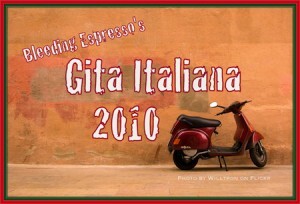 Today’s stop on the Gita Italiana 2010 is in Campania, and our guide is Karen Wolf of The Shock of the Old. Welcome Karen! When I came to Sessa Aurunca to marry my husband, I moved into a house filled with a great assortment of books. I appropriated them all, filing them in amongst my own, and as I read them, I annotated their margins in pencil, marking them as mine. Among these new acquisitions was a slim volume by one Antonio Marcello Villucci, an introduction to the history and art of Sessa Aurunca, presented in the form of a walking tour. In the beginning I used it as a work of reference, flipping through its pages to find illustrations of things I had encountered on my walks around town, and scanning the accompanying text for names and dates. Later, when there were no new streets or alleys left to explore, it became something of a treasure map, directing me to the few remaining sights I had somehow overlooked. The last of these was a loggia, in the Catalan style, and the caption beneath its picture told me to look for it at Corso Lucilio, no. 98. On the Corso, the numeri civici followed a palimpsestic logic. They skipped and stopped and started again. Some buildings had no numbers at all, others as many as three. They were stenciled in red, or black or orange, or painted in blue on white ceramic tiles. Odd numbers lined one side of the street, and even numbers the other, except in the places where they appeared together. They suggested an urban history full of modifications and restorations but they did not lead me to the loggia. For weeks I parsed the architecture of the Corso for clues to its location. I examined windows and arches, and guessed at the thickness of walls. I peered into courtyards through open doors, looking for the loggia or any hint of its Catalan style. From one day to the next, these portals opened and closed, as though in a game of musical doors, or memory. I began to wonder whether the loggia was hidden behind a door that remained forever locked, or if I had simply missed every opportunity to chance upon it. One morning, months after I had abandoned my search for the loggia, I pushed my daughter in her stroller past a stone portal that I was sure I had never seen before, although its great size made me wonder if that were possible. Its arch opened onto a wide, barrel-vaulted passageway, and just beyond that was a small white-washed courtyard where a flight of stairs led to a mezzanine on the first floor. Unable to account for the feeling I had that the loggia was near, I shrugged it off and continued on our way. A couple of weeks later, an errand took us to the same stretch of the Corso. I stared into the white courtyard as I wheeled my daughter past it. 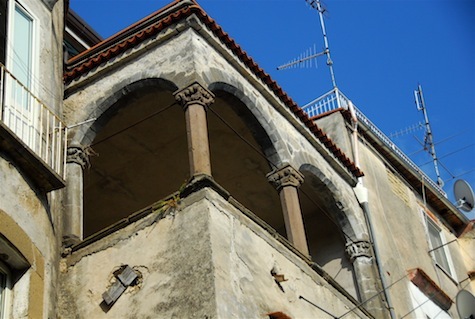 A few doors down, I paused, and sensing once again the presence of the loggia, I retraced my steps. In the barrel-vaulted corridor, I noticed a massive wooden door leaning on its long edge against a wall. From the foot of the stairs, I looked up at the mezzanine. Following it around the walls with my eyes, I turned my head to the right and noticed that the white courtyard opened onto another, much larger one. Along its far side was a tall, nondescript apartment house, and to the left and right, two rows of garages, their doors painted green. “Where are we going, Mommy?” my daughter asked. “Home, baby. There’s nothing here,” I told her. On the night of Pasquetta, we descended the Corso under glimmering, golden lights. We passed the candle-lit church of San Giovanni in Piazza and then the palazzo where twice before I had sought the loggia. In the quiet calm of the darkened street, I sensed the town speaking to me with a golden resonance. “Can we go in there for a minute?” I asked my husband, indicating the great stone arch. ‘What is this place?’ he wondered aloud once we had entered white courtyard. I walked into the darkness of the second courtyard and turned slowly to face the entrance. Raising my hand to shade my eyes from the light shining beyond the arch, I perceived, directly to the right of it, the mass of a cylindrical tower, and as my vision adjusted to the darkness, the profile of the loggia. Karen Wolf is an art historian living in the Campania region of southern Italy. When she’s not on the hunt for architectural treasure, she blogs as KC at The Shock of the Old. Wow! This is another one of the blogs that I look at. KC does a great job writing about her area of Italy. Love portals, doors, windows and … old stuff! What an inspiring blog. Thanks for sharing Karen and thanks Michelle for posting all these great gitas! So, was the loggia in there? It must have been! Thanks again, Michelle, for inviting me to contribute to the Gita! I had great fun writing this post…and as for the delay in putting up the ending, I’d like to think that deepening the mystery a bit just made the post a little more intriguing to some of its readers. Those hidden treasures make our beloved towns fresh and new again. Lovely story! I love finding new things here too…always something!